Born Oct. 4 1925, Ruane initially graduated from the University of Minnesota with a degree in electrical engineering in 1945 and then from Harvard Business School in 1949. After graduating from Harvard, he went straight into the world of Wall Street; however, he realized the need to get a better idea of the business world or more specifically the investment world. Thus, Ruane enrolled in Columbia University in 1951 to study under the great Benjamin Graham; that is where he met Buffett, who was also a student at the time. Warren Buffett recognizes Ruane as one of the ‘Superinvestors of Graham-and-Doddsville’ (required reading for all Value Walk readers). Buffett has mentioned Ruane and acknowledged him as as the only proficient investor he felt was worthy of being recommended to his investment partners. In 1969, Buffet was faced was an investment dilemma due to the rising prices of the bull market, which hinted at the over-pricing of the majority of stocks. Buffett was holding a large amount of cash because he could not find bargains in the overpriced market. Some members of the Buffett Partnership were voicing their dissatisfaction with the relatively lower rate of return due to the high cash allocation. To solve the dilemma, Buffett asked Bill Ruane to set up a fund to handle his partners who desired to stay in the market. In 1970, Ruane established his own firm, Ruane Cunniff, with partner Rick Cunniff, and in the same year, at the demand of Warren Buffett, launched the flagship Sequoia Fund, an open-ended mutual fund. Sequoia Fund is one of the very few funds which has for more than 40 years managed to outperform the S&P 500 index with an annual compounded return of 14.5 percent (while S&P returned 10.6 percent annually over the same period). As Buffett puts it ‘Size is the anchor of performance’, with the increase in the size of the amount, the harder it gets to achieve good performance. Therefore, as the amount of investments under the management of Ruane grew, he felt the need to protect the rate of return for his existing investors. In 1982, Bill Ruane closed the funds to all new investors and only allowed existing investors to purchase additional shares. 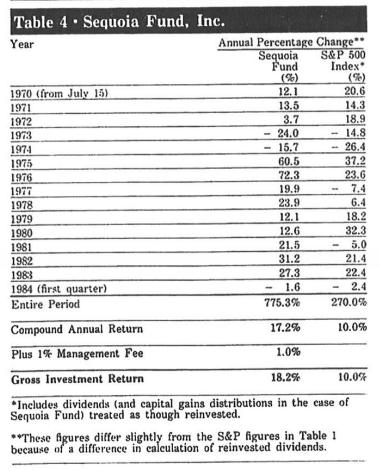 This created a flourishing demand for Sequoia shares in the “black market”, with individuals even willing to pay $1000 for a single share of Ruane’s fund. In 2008, however, the doors of Sequoia Funds were opened again to new investors. Ruane passed away on Oct. 4 2005. However, his great achievement and his philosophy of investing is forever encapsulated by his Sequoia Fund which has, crushed the market over the past 40 years. As mentioned earlier in the article, Ruane studied under Graham along with Buffett. His investment style was more similar to that of Buffett’s than Graham’s. Like every other value investor, he believed in buying good stocks at attractive prices. Bill Ruane searched for companies with healthy balance sheets and invested only in those stocks which were traded below their intrinsic value. Similar to Buffet, Bill Ruane did not believe in unnecessarily investing in unattractive stocks just to be fully invested, he focused his investment to only those which were under-valued and was not afraid to hold cash or invest in U.S Treasury Bills when the market was over-priced. In order to preserve a considerable margin of safety, Bill Ruane maintained a portfolio which consisted of stocks that he was highly confident about. Berkshire Hathaway, one of Ruane’s earliest investments, made up 30 percent of his asset portfolio some of the time. Berkshire Hathaway comprised over 20 percent of Sequoia’s portfolio until very recently. Similarly, his portfolio consisted of large portions of other companies with promising growth in value. Therefore, short-term loss could be cushioned with the considerably high margin of safety. Highlighting the main facts of Bill Ruane’s investment philosophy, he avoided the use of the technical market valuation method and instead focused on the company’s balance sheet analysis and earnings history to determine the true value of investment. Being a long-term investor, his basic principle was to acquire large portions of stocks of companies he was confident in. Moreover, he looked for companies with little or no debt which generated enough cash flow in the future and avoided dependency on markets for funding or financing of operations. Any stock, be it domestic or international, which promised high value in the future with attractive purchase prices was considered and without timing the market, as the market is never consistent or completely predictable. Furthermore, having a clear understanding of the exposure to market along with the dependency of stock valuations on consumer or business spending patterns would facilitate a better understanding of the risks involved in that particular investment. Security Analysis (1934) written by the legendary Benjamin Graham and David Dodd was believed to be the Bible of Wall Street and the greatest book on research ever published. The book brought to life the concept of value investment and is deemed to be the most essential read for any investor. The book has released 5 editions over the past few years with changes in examples and language according to the time period. 2003 — Sequoia Freezes Up Is A Little-Known Irs Rule Stopping A Legendary Stock-Picking Team From Investing In Their Best Ideas? 1998 —The Markets: Market Place; A Question For Buffett: Will General Re’s Institutional Holders Fit In At Berkshire?